Custom Molder of Rubber and Cast Polyurethane Components. 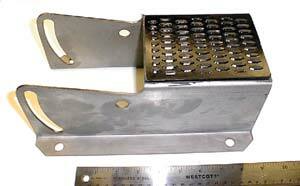 To the left is an example of a custom molded foot pedal used in large excavation equipment. The chemically-bonded urethane pad exhibits wear resistance, making it look better and last longer despite highly abrasive environments. Material Compound: Most pedals are made with 80 Durometer Shore “D” Black Pentathane®. Hardness, as applied to elastomers, is defined as the relative resistance of a surface to indention by an indenter of specified dimension under a specified load. The most commonly used measuring instrument is a durometer. Numerical hardness values are derived from the depth of penetration. The harder the sample, the further it will push back the indenter point and the higher the readings. On the durometer A scale, 0 is very soft, and 100 is very hard. Values are usually read immediately after firm contact has been established. The hardness range of elastomers is so broad that a single durometer cannot indicate practical measurable differences of hardness. For this reason durometers are available in more than one scale model, (eg., A and D scale durometers). The A scale durometer is widely used throughout the rubber industry. The durometer D model, which has a stiffer spring and a more pointed indenter, is used to measure the hardness of hard rubbers. Special characteristics: abrasion and cracking resistance helps keep the pedal looking brand new for years to come. Often going unnoticed, door bumpers are important at work and in your home to protect your walls from dings and dents caused by doorknobs. Today, we’re talking about the features our door bumpers have that make them stand out from the competition. Material Compound: These bumpers are made with 35 Durometer Shore A grade elastomer. It also features a fastener chemically bonded to the SBR elastomer for easy attachment to equipment. 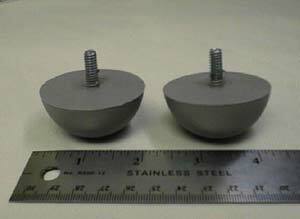 Impact Resistance: The impact or shock resistance of an elastomer is determined by striking a sample with a swinging pendulum (hammer). The sample is placed at the lowest point of the arc traveled by the pendulum head. Measuring the difference in the distance of the upswing of the pendulum after the impact, compared to the same upswing with nothing in its path, determines the energy in breaking the sample which is the measure of impact strength. Non-marking Grey Color: The material and its impact resistance keep the bumper from making any marks on the door or wall, and its grey color keeps it hidden from view. Pentathane Applications - Wipers Wiper used to material handling in food processing equipment. This material is both FDA approvable and abrasion resistant for durability. Pentathane Applications - Wheels Pentathane® chemically bonded directly onto precision sealed bearing molded to tight concentricity specifications. Elastomer Applications - Hose Hose configured for limited space in marine engine application. Elastomer Applications - Tube Oil resistant molded tube used on combustion engine. MOLDED DIMENSIONS, LLC Engineered Elastomer Solutions to Help You Win.